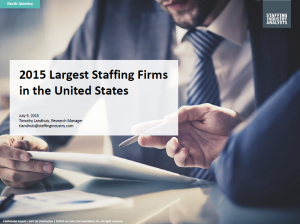 According to SIA, 122 staffing firms generated at least $100 million in revenue in 2014. Together, these 122 firms generated $69.4 billion in revenue in 2014, representing 55.9 percent of the market. Medix provides workforce solutions to clients and creates opportunity for talent representing a variety of industries through our Healthcare, Scientific and Information Technology divisions. Medix has been featured on such prestigious lists as Crain’s Chicago Business’ “Fast Fifty” and the “Largest Privately Owned Businesses in Chicago.” Medix was also featured on Inc. Magazine’s “Inc. 5000” list of the nation’s fastest growing private companies and “Hire Power Awards” list for hiring in human resources, as well as Inavero’s “Best of Staffing” Client Award for providing excellent service to clients for the second consecutive year. We have earned our reputation as an industry leader by providing unsurpassed customer service to our clients and talent. For more information, call (866) 44MEDIX or visit 34.201.9.20.